The CD offers two meditations, one for healing and one for manifesting. 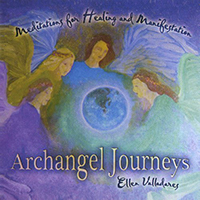 Guided by Ellen Valladares and set to soothing background music, the journeys will assist you in connecting with four of the Archangels (Michael, Gabriel, Raphael, and Uriel), as well as one of your guardian angels. Relax, release, and receive the comfort, peace, and blessings the angels bring.